New Summer Candy to Try! Fruit Stripe gum now has a jumbo pack! This pack has sticks of cherry, grape, lemon, cotton candy, and other fruit flavors. You’ll want a pack of this wherever summer takes you. Slush Puppies are super refreshing on a hot day. This Slush Puppy spray candy will make sure you have the cherry and blueberry flavors you love ready to go whenever you’re craving a slushie. Sour Punch straws really live up to their name, don’t they? Try apple, blue raspberry, cherry, strawberry, watermelon, and rainbow straws for a punch to your summer snack. Rip Rolls give you 40 inches of your favorite gummy candy! Grab a roll or two to take on car trips or pack away for summer camp. There’s plenty of new summer candy on our Just Arrived Page! 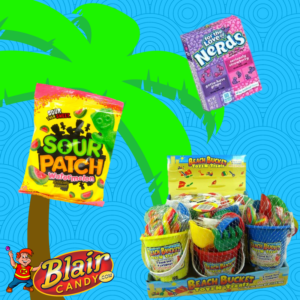 Shop all candy and snack food treats now at BlairCandy.com to have a pretty delicious summer. Bake a couple red, white, and blue sheet cakes, add Pop Rocks, and assemble into “firecrackers” for this cake treat! See how to make these cake firecrackers at Elegant Wedding Invites here. You can’t go wrong with cookies, right? These cookie bars are super delicious and filled with patriotic M&Ms. See the recipe at Number 2 Pencil here. If you want something that just has candy only, these gummy bottle rockets are the way to go. See how to make these Poppin’ Bottle Rockets on She Knows here. There are plenty of fun dessert possibilities for your patriotic table with our selection of 4th of July candy. 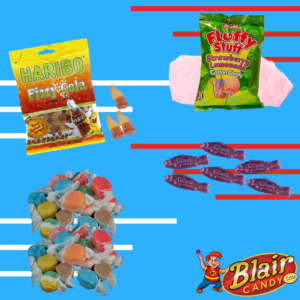 Be sure to visit BlairCandy.com for all of your summer and patriotic candy. You’ll find plenty of treats that you’ll be snacking on all summer long! 4th of July is almost here! In addition to fireworks, outdoor activities, and good food, candy is a must for some sweet fun. 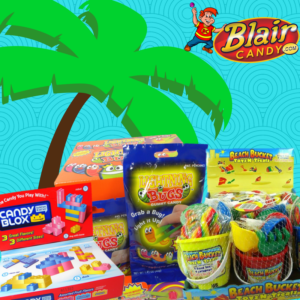 Blair Candy has plenty of summer candy for you to bring to the party. Choose from patriotic candy or fun summer favorites to make everyone happy. We mentioned some patriotic candy that would be great for a buffet last week, so this week, we’ll show you summer treats to add! Gummy Candy – What can’t you find in gummy form? We recommend purple gummy fish, cola bottles, hamburgers, and gummy strawberries. Cotton Candy – Go with either a classic flavor or with a strawberry lemonade flavor. Just make sure you give it out in individual bags to avoid messes. Salt Water Taffy – The original summer candy! Your guests will be drawn to this sweet and salty treat no matter what the occasion is. 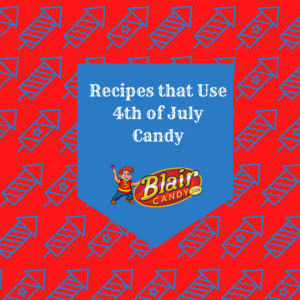 Check out other summer candy to get ideas for the 4th of July or keep stocked all summer long! You’ll find plenty of old favorites, regular candy bars, and a new novelty candy to enjoy. Stay sweet all summer with this selection of summer snacks and candy! Now & Later Candy: These chewy, fruity candies might remind them of Starburst without the unique flavors. Pop Rocks: Kids will love these. Bonus points if you add a little soda with them for a super fizzy feeling. Cow Tales: Chewy caramel with a cream center is a guaranteed favorite. Try the original or one of the flavored caramel boxes. Shoe String Licorice: You’ll be ordering more, once your kids taste this candy! This candy is fun to eat and play with and gives them hours of fun. 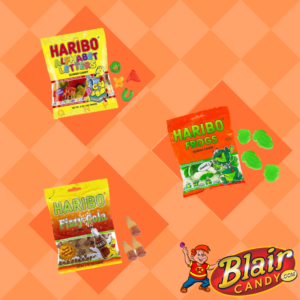 Blair Candy has these and many more retro candy options for you to share with your kids and grandkids. Not only will you get to share a sweet treat, but you’ll also get to share childhood memories with those you love. 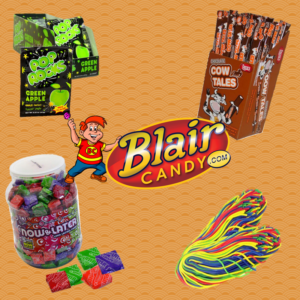 Shop now for the ultimate retro candy party! New Gummy Candy to Try! Gummy candy is great isn’t it? It comes in crazy shapes, colors, and flavors and instantly makes snack time more fun. We have tons of new gummy candy in stock and ready for you to try! These new Haribo treats will go nicely with old favorites or with other new gummy candies. Alphabet Letters: These gummy letters are a great (and yummy) teaching tool! Teach a little one how to spell or play word games with these treats. Dinosaurs: Eat by themselves, play with them, or add them to dirt pudding! These dinosaurs are super fun and just as yummy to eat. Sour Spaghetti: Braid it, make it into bracelets, or decorate other cupcakes with these gummy strands. These are really good with an ice cold soda on a warm day. There’s plenty of other gummy candy treats that are brand new and ready to be shipped on BlairCandy.com. See these and others today for a delicious gummy treat! Sweet Summer Fun with Candy Toys! Candy Blocks: Kids love to be creative and make new things. These blocks will lead to hours of fun and lots of imaginative play! Lightening Bug Candy: These gummy bugs really do light up! Pick them up with the light up tweezers and you’ll get to see them in action. Beach Bucket with Candy: Beach days are the epitome of summer. Get them ready with this beach bucket filled with toys and candy. They’ll build cool sandcastles and enjoy some sweet treats. Blair Candy has these and plenty of other candy toys for them to enjoy and play with. Shop now to keep kids busy all summer long! Make a 4th of July Candy Buffet! Gum Balls: Who doesn’t love a good piece of bubble gum? Not only do these candies look great in a buffet arrangement, but their hard candy-coated shell will withstand the heat! M&M’s: Red, white, and blue M&M’s can be used for a number of things at a 4th of July party. Use them in small candy dishes throughout the setting or decorate desserts. The possibilities are endless. Lollipops: Kids can enjoy these lollipops while watching the fireworks for a sweet ending to the day. They also look really cool in a buffet setting. Jelly Beans: Guests will have fun figuring what flavors make up these red, white, and blue candies. Find them in individual bags for the perfect parting gift! 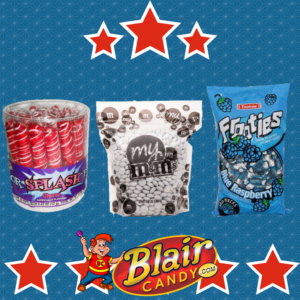 No matter what you choose, you’ll find a variety of patriotic 4th of July candy at BlairCandy.com. Start getting ideas today for the best 4th of July party on the block! M&M’s – Everyone wants extra chocolate in their sundae! M&M’s not only give you the chocolate you’re looking for, but also that candy crunch that is so satisfying. Chopped Nuts – Can you have a sundae without chopped peanuts? Not really. Chopped peanuts are great, but adding chopped almonds can also add more flavor to a sundae. Liquid Topping – Fudge and marshmallow topping are a must! These are a great finishing touch to any sundae. Fudge, marshmallow, strawberry, and caramel are usually the fan favorites. 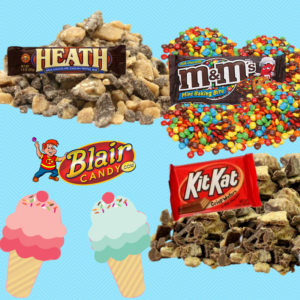 Blair Candy has these and plenty of other classic and crazy toppings for your ice cream sundae bar. Everyone will talk about how fun the idea was and how many ice cream toppings they added to their sundae! Shop now to get started, and don’t forget the sprinkles! Have someone heading to camp this summer? While they probably have access to a camp store, bringing their favorites along will ensure they have plenty of snacks to hold them over all summer. 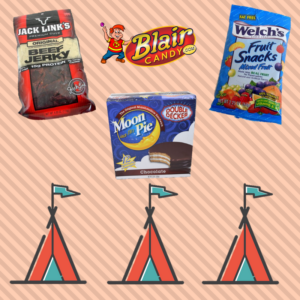 These are a few bulk snack food items that are most requested by campers! Beef Jerky: This savory treat withstands all types of environments, making it a favorite. Choose from a variety of flavors, or mix them up, for a quick snack on the go! Moon Pies: It’s a classic treat for a reason. With layers of cookies, marshmallows, and chocolate they’re practically irresistible. Sunflower Seeds: This treat tends to last campers all summer. As a quick bite here and there, it’s great alone or unshelled in a trail mix. Fruit Snacks: These are already a lunch favorite, so it only makes sense that they’re great for camp too. These snacks come in all kinds of flavors and shapes, so you’ll easily find the best combination for your camper. 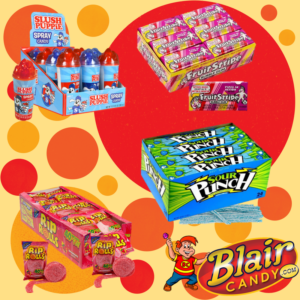 Blair Candy has plenty of bulk snack food and candy your camper will love. Not sure what your camper wants? Send one of our Camp Survival Treat Boxes for a fun mix of treats they’ll enjoy and share with their friends. Shop now to make sure your camper has enough for summer! Summer Candy to Start the Season! Sour Watermelon Slices: Watermelon and summer goes hand in hand. Avoid the mess of watermelon and grab a handful or two of these delicious sour gummy slices. Nerds Candy: With interesting flavors and silly little characters on the box, who doesn’t love Nerds? Grab a bulk box with individual packages for fun all summer. Beach Bucket: Toys? Check. Candy? Check. Beach Day? Check! This bucket had candy and beach toys together for a great day at the beach! There’s plenty of other summer candy favorite on BlairCandy.com! From festive shaped gummy candies to lollipops, you’ll find everything you need for the season. Shop today to get enough treats to last all summer long.